January 1, 2019: In 2018 two different rail trails (ARRT and BFRT) opened in Acton. So the Acton Police department has written and printed a new bike safety brochure. This spring it will be placed on many of the trail kiosks and used at school safety classes. A copy can be seen here. October 25, 2018: Acton-Maynard bike share ribbon cutting. 50+ people turned out at the Maple Street bike racks. Acton and Maynard have joined the Minutemen Bike Share Network. There are racks in West Acton, South Acton Station and Maynard. Sponsors include West Acton Villageworks, Duncan Donuts, Pro-Tech, Town of Acton and Maynard Mill&Main. August 10, 2018: There was a great turnout for the ARRT Ribbon Cutting of the Acton & Maynard section! 90+ people joined local and state officials at the South Acton trail-head, just 100 feet from the South Acton MBTA Commuter station. More photos in the grand opening gallery. January 20, 2018: More photos from 2017 added to the new Construction gallery. September 1, 2017: The City of Marlborough has teamed up with Cambridge-based Zagster, Inc., to offer a bike-share program to city residents, employees and visitors. The two-year pilot started with 30 bikes across five stations. The Marlborough Zagster stations are located at the Assabet River Rail Trail (Sasseville Way), the Walker Building (downtown), Marlborough Hills Office Park, Embassy Suites Hotel (RT-20) and RK Centers (Home Depot). more details. 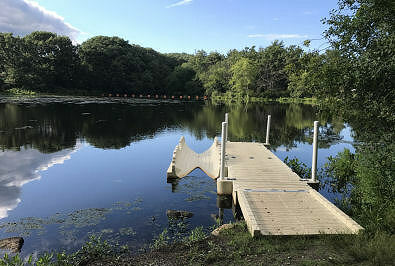 August 1, 2017: Ice House Landing, which is a town park on the ARRT in Maynard has dedicated a new boat dock. The rail trail actually has 4 places with access to the Assabet River, and its own map on the ARRT website.